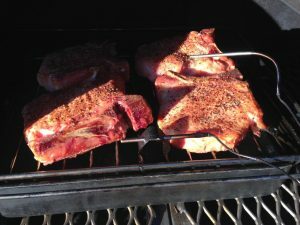 I’ve never cooked PORK LOIN CHOPS on my Lang BBQ Smoker, mainly because most are too thin and it’s not worth the effort to set up the smoker cooker for a short cook. Another BBQ site suggested using thicker cuts of meat. 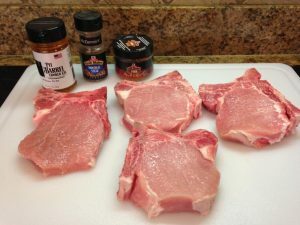 I had my butcher cut 3 center cut pork loin chops about 1” thick (2 fingers). 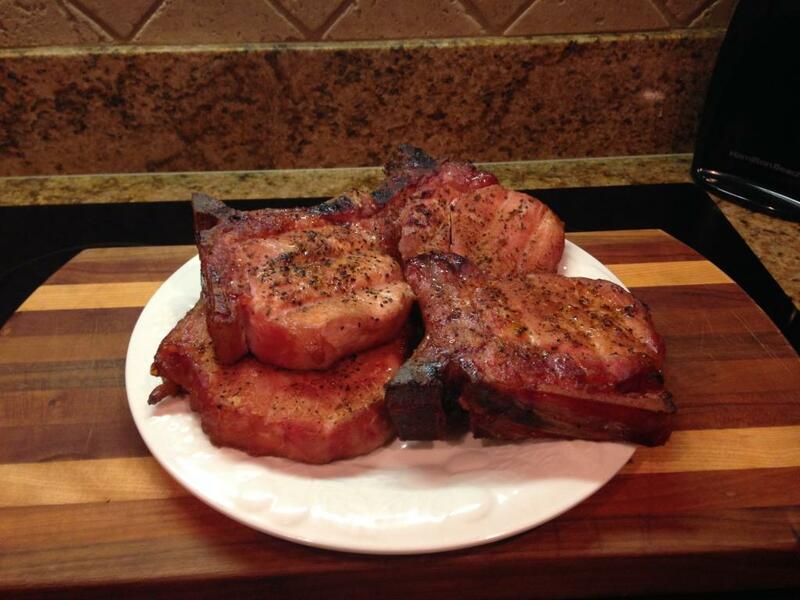 PORK LOIN CHOPS - Ask for Center Cut and have butcher cut them 1" thick. I trimmed the perimeter fat, which won't penetrate the meat, and also trimmed the thin layer of silver skin under the fat. If I didn't remove the silver skin it will shrink during the cook and cause the meat to “cup”. If I didn't want to remove the fat/silver skin I could have cut slits through the fat/silver skin down to the meat. Heated 32oz of apple juice and then add the rest of the ingredients, including the rest of the apple juice. When it cooled, pour the brine into a ZipLock bag, added the chops and refrigerated for 3 hours. I was looking for 140* internal and flipped the meat at 130* internal. I started the cook at 4:00PM and my cooker temperature averaged 265*. Windy and cold conditions were a problem during this cook but by 5:15PM,1 piece was at 140* so I had to let the other 2 cook a few minutes longer. The Thermopen, or other digital devise, is very important when cooking different size pieces of meat. This entry was posted in Meat and tagged smoked pork loin chops by . Bookmark the permalink.